The auction proceeds go to a good cause too. If you aren’t familiar with Jeff Gordon then you are most probably a communist or perhaps you just don’t follow NASCAR, although that may amount to the same thing. 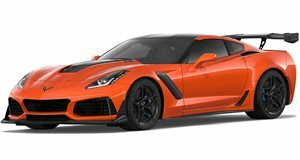 Either way, everybody likes a bit of power and the Cyber Gray Corvette ZR1 being auctioned off by Barrett Jackson has plenty of that. 638 horsepower to be precise, thanks to a supercharged 6.2-liter LS9 V8 that has barely even been run in. Jeff purchased this ZR1 10 years ago and even he must have been shocked by this things acceleration because he barely drove it: the odometer shows a mere 815 miles. This particular ZR1 is one of only 502 finished in that cool Cyber Gray paintwork and it comes kitted out with everything you would expect a NASCAR champ to want in his daily driver. The car has Brembo carbon ceramic brakes, Selective Magnetic Ride suspension, electronically limited slip differential, multi-mode performance exhaust and a rear differential cooler, essential for those smoky burnouts. And of course, it has a six-speed manual instead of an automatic transmission. This Corvette may be a decade old, but it still clearly has what it takes to take on contemporary sports cars. As you would expect of a car that has averaged 81.5 miles per year, the interior is spotless where notable features include a head-up display and leather-wrapped dash and door panels. The premium Bose sound system even comes with a CD player, handy if you still have any CDs left in your collection. Every cent from the proceeds of the sale will go to the Jeff Gordon Children’s Foundation. Founded in 1999 to support the research of leading pediatric oncologists to help combat childhood cancer, it is a very worthy cause to support. The auction is expected to go ahead on April 12 so if you have always hankered for a brand-new 10-year-old ZR1 that was once owned by a motorsport legend, then this is your chance to own one.